My name is Sunshine. It’s been raining in the Pacific Northwest for what feels like years, need I say any more? If there is one thing we all need right now it’s some Sunshine! Complete with vitamin D for Delightful… or Darling… or Devoted – you choose because I’m all three! 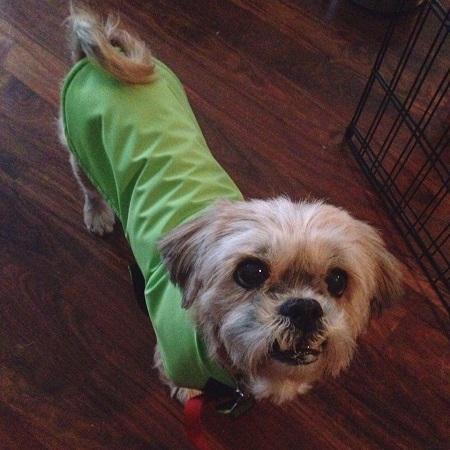 I’m a Shih Tzu that is 12 years young with plenty of spring in my step. Think a little rain will slow me down? No sirree, as long as I have my coat on I walk around the neighborhood like the best of them! In fact walking outside is the highlight of my day. Of course I also enjoy snuggling, giving sloppy kisses on the cheek, knitting and all other activities ladies my age are known to engage in. I do well with other animals as long as they give me some space. If they can have their couch cushion and I can have mine we will be sure to get along fine. Do I sound like the gal you have been looking for? Fill out the application so we can schedule a meet and greet. I am in good health, fixed, vaccinated and microchipped. My adoption fee is $150. I am currently living in foster care.